I ran out of products to do a review. 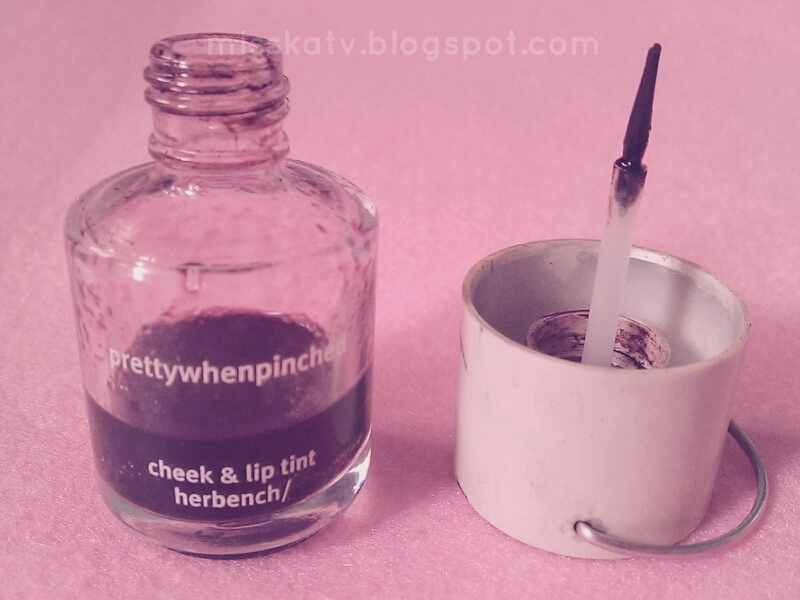 So I'll just share with you my old / vintage Cheek & Lip tint from Herbench/ which I have for like 4 or 5 years now. Yah, I know I shouldn't keep any make up that long. It takes me forever to finish this product! hehe. I know it's kinda gross but it still do its job so why throw it? Unless it started to irritate my skin. I do check my make-ups once in a while, like swatch it to my wrist. We all know expiration dates mostly came off with the packaging. Whenever I wanted to go out not wearing too much make-up I always ended up using my Missha BB cream, Maybelline gel liner and my prettywhenpinched cheek & lip tint. But I mostly use this only on my cheeks and apply my Nivea lip gloss on my lips. Build-able and never tends to look overdone. I suggest you rub it first between your fingers then apply it on your cheeks. Don't apply it directly from the brush. Do one cheek at a time & blend. What's the best cheek/lip tint have you ever tried? Alarming right? :/ it looks cool though. Hehe. Powder blushes are the best! :) we should really spread the news. Tsktsk. Yeah. They should close their spas asap. Lol. Aww I really wanted to try the fish spa! Thanks for the info though, it made me think twice. Haha! Is the lip and cheek tint still available at Bench stores? Strong smell? eeks! I can't wear strong smelling products..
omg, didn't know that about fish spa's I'm glad I never tried it. Thanks for letting us know. I'll be reading the link you posted. i agree with catmare's comment. :) i think the etude house and tony moly also has a similar tint. 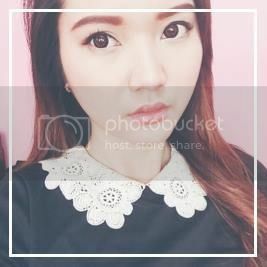 anyway dear, thanks for publishing the info on fish spa. Never tried lip and cheek tints before but I think I might try them now. And waaa I never knew about the fish spa thingy. I mean, I've heard of it but never wanted to try it 'cause those fishies have already been eating stuff from other people's feet, and I don't think it's just right for the fish to eat stuff out of our feet anyway @. @ Geez that's just gross for both sides. i love yours too! been into yer layout and cute things! thank you a lot for your comment ^.^!!! wow, that's some serious info. Thanks for sharing about the Fish Spa thingi. 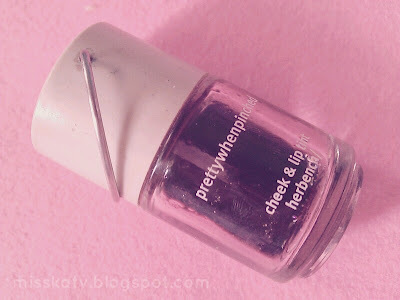 and Oh, when you get rid of this lip/cheek tint, I saw a lip/cheeck tint at Etude House, it looked really promising. try checking it out...hehe.. thanks for the review. Ooh, I've never been to Herbench for years already! LOL I also tried that when it was still in a tube and yeah it dries quickly! But I like how it leaves a natural blush. Anyway, I don't use blush nowadays and I think I should be shopping for one now, lol. i did that fish spa! it was so ticklesh at first but then it was ok afterwards :D!! ohh i think i have that too, although mine was in a tube. Thanks for liking the award dear:) Happy(^~^), and thanks again for sharing the informations about this Fish spas!. I'm actually curious with the fish spa. hehe. thanks for the info :) I never thought before that it can transfer diseases. awwee the bottle is so cute and I love the name of this! eeks. that fish spa business sounds alarming. I can definitely imagine all sorts of parasite and infectious disease being spread.